Offton is a scattered village, deep in the valleys. The Limeburners, on the way to Somersham, is one of Suffolk's best pubs, or was, in the days when I knew the pubs of Suffolk better than I do now. In Offa's time, when all England was being forged by the interplay between the three great kingdoms of Northumbria, Mercia and Wessex, there was a castle here, and it may be that the king of Mercia himself had one of his homes here, giving his name to the village in the process. This may only be a story, of course, but it is a good one, and there was a castle, on the hill above the church. 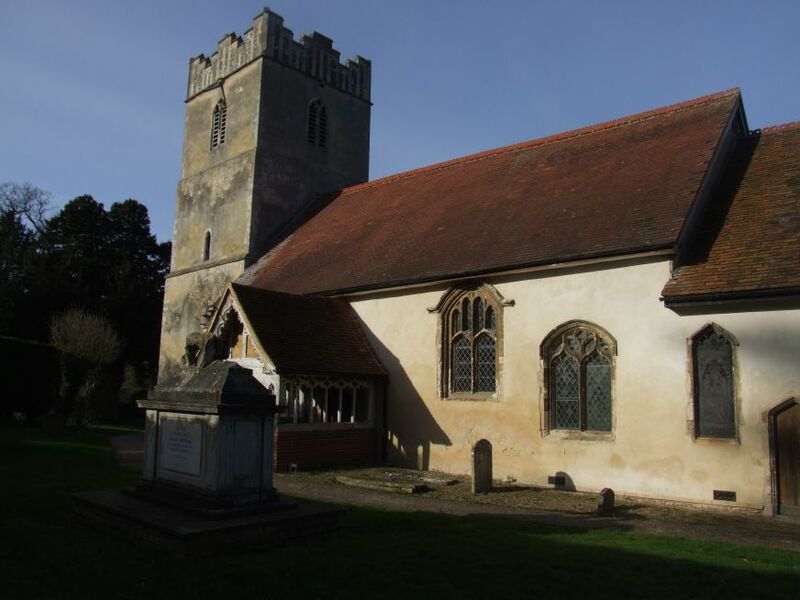 St Mary is all of a pleasing mixture, with its elegant unbuttressed 14th century tower, and windows of all periods. To the south of the church is one of the county's most unusual outdoor tombs; a weeping woman holds a horse by the head, while a body lies slumped on the floor. This seeming excerpt from a Wilkie Collins novel depicts the final scene in the life of Sarah Wyard, who was thrown from his horse in 1867. I'd last been here in 1999, and in those days you let yourself into the church through the pretty wooden south porch. The great change since that time has been the building of a small extension on the north side of the church, housing toilets and a kitchen. This is now the main entrance. 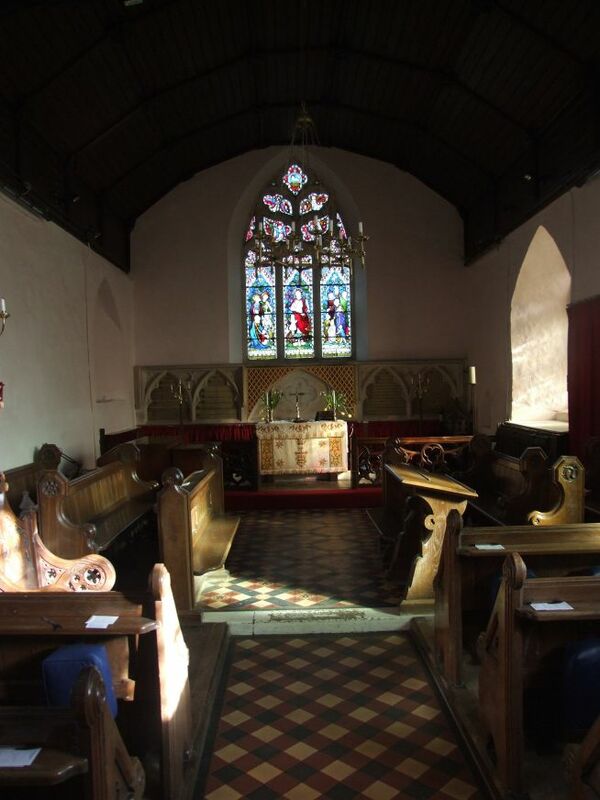 It is brilliantly done, looking a little like a medieval porch converted into a Victorian vestry. I did not even notice it until I came to enter. It is particularly brave, because this is the side of the church which faces the road. The church is locked, but there are two keyholders, both very close at hand. The nice man who gave me the key came across with me, to show me the windows, which we will come to in a moment. Internally, this is essentially a Victorian church, the work of Frederick Barnes. 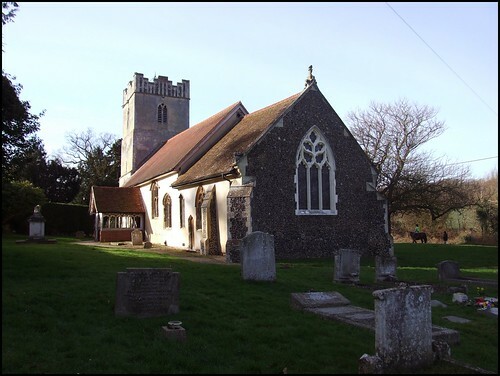 He also did the restoration of nearby Baylham, but is probably best known for designing the elegant railway stations at Needham Market and Stowmarket. The restoration was a good one, leaving a patina of age and a number of medieval features. It was over seen by John Thompson, Vicar here from 1858 to 1903, When Thompson arrived here, the church was derelict, and he left it in almost exactly the condition it is in now; so the whole building is testament to this remarkable man. The glass in the east window was given by Thompson in memory of his daughter Helen, and depicts Christ summoning the children. What is most striking, and perhaps a little extraordinary, is that the little girl at Christ's feet looks exactly like Tenneil's Alice. Intricate foliage winds elegantly around the scene. 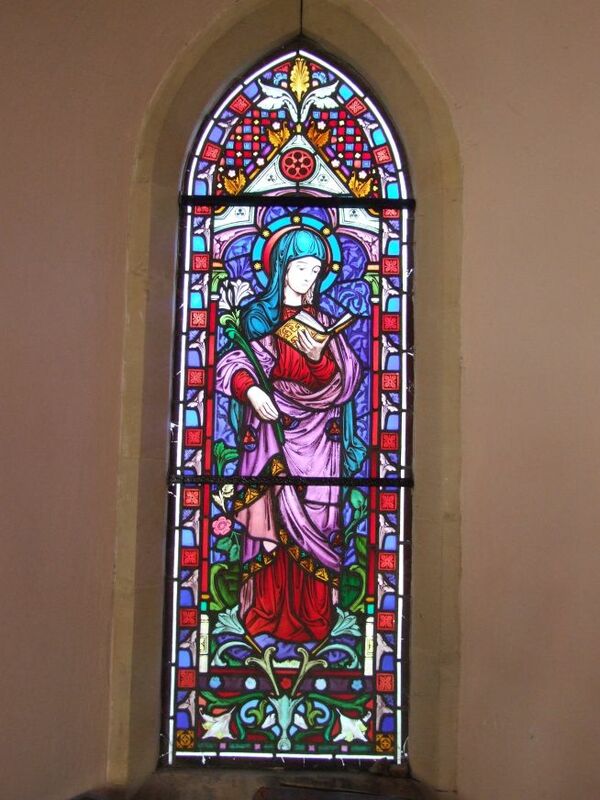 It does not appear to be signed, but Mortlock thought it was by Hardman & Co.
To the south of it is the most interesting glass in the church, an early work by Lavers, Barraud & Westlake depicting the Annunciation. It was rather hard to photograph in the bright sunlight, and in any case is now rather eroded by a century and a half of pollution. But it is still stunningly beautiful. 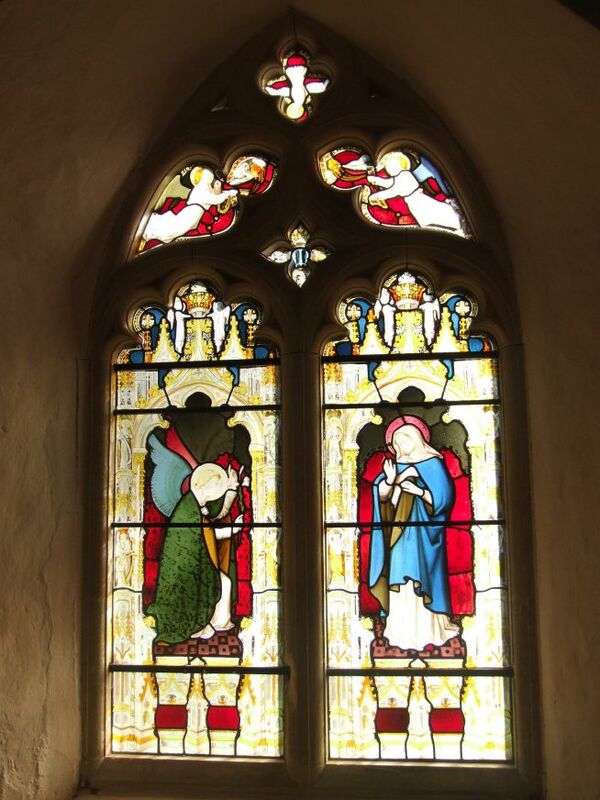 There are also lancet windows of Christ the King and Mary of the Annunciation, both from the early years of the 20th century, I should think. The one piece of medieval glass is a heraldic shield of the Bohuns, who were lords of the manor in these parts in the 14th century. The glass beneath the west window also appears to be by Lavers, Barraud & Westlake, and depicts the Presentation in the Temple. This church also has an interesting medieval holy water stoup with a triangular hood. Mortlock thought it strange that it had survived, given that Dowsing visited in 1644 and gave express orders for its removal; but there is no reason to think that it was not simply blocked up, and then uncovered again on its discovery by the Victorians, as at Ipswich St Mary Elms. It may well be that the bowl is a Victorian addition, but the recess itself is original. The space under the tower is pleasing, the sallies looped like sausages in the coloured light. The font stands now near the middle of the church, near the south door, making a pleasing focus. 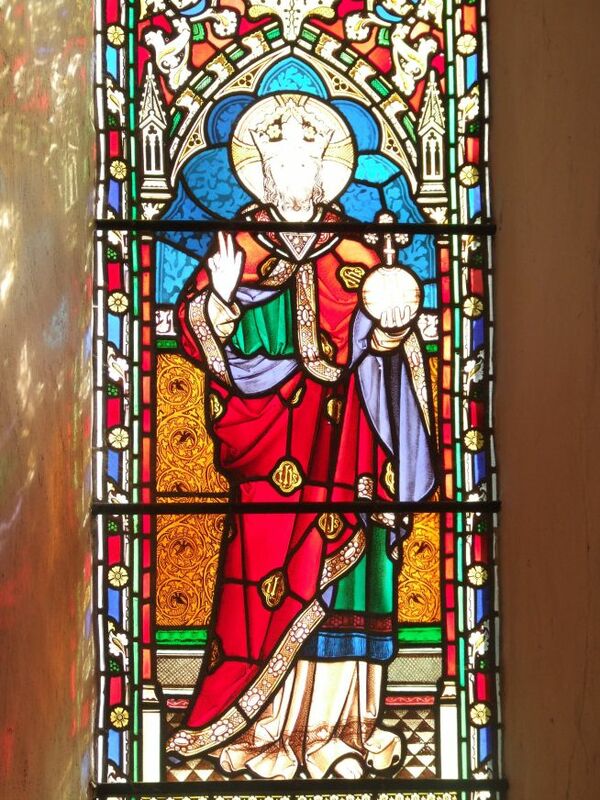 It includes the symbol of St Edmund on its panels. The main medieval survival is in the form of woodwork. 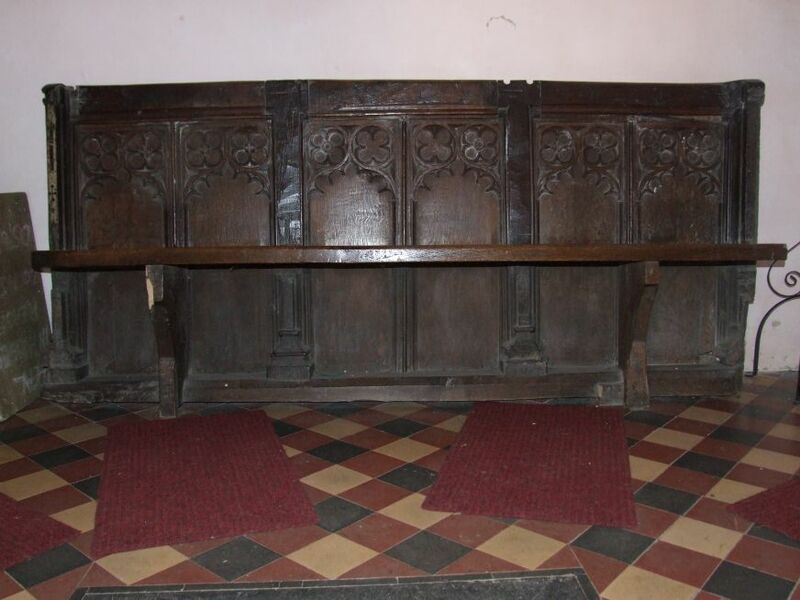 Part of the medieval roodscreen is set against the south side of the chancel, while the other half has been converted into a bench beneath the tower. There are carvings in the spandrels, and what appear to be traces of original paintwork. The other medieval survival is the roof beams. The one at the west end has intriguing but unclear carvings in the spandrels. Is it an Annunciation scene? Or are they figures engaged in activities? Altogether, there would have been twelve of these spandrels, so did they once depict the Labours of the Months? Like several other country churchyards, Offton has had almost all its older gravestones removed, probably at some time in the 1950s. The modern graves that replaced them are in straight lines, and the trim, unfenced graveyard has all the atmosphere of a municipal bowling green. But for all that, St Mary is a lovely church; I like it very much.